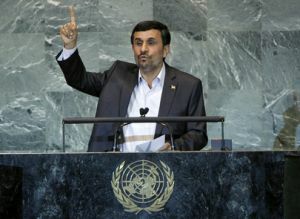 NEW YORK, Sep 23, 2011 (IPS) – Iranian President Mahmoud Ahmadinejad’s address to the United Nations Thursday followed the script of his previous six visits to New York, with strong criticism of the United States, messianic language, and vague utopian statements on how to govern the world, Iranian-style. He accused European countries of “still us(ing) the Holocaust after six decades as the excuse to pay fine or ransom to the Zionists”, and condemned the U.S. for killing Al-Qaeda chief Osama bin Laden instead of trying him in a court of law. That was enough to lead diplomats from the U.S. and some European countries to walk out of the General Assembly hall while he was speaking. The address “was similar in tone and content to his previous six speeches. It was a mélange of anti-imperialism, anti-Zionism, conspiracy theory, and Shiite fervour,” Karim Sadjadpour, an Iran policy analyst at the Carnegie Endowment, told IPS.“The first six times he gave the speech, many people were shocked and offended. But I think he has become so predictable that his words no longer have the same shock value. It would have been far more shocking had he given a dignified address,” he said. British Prime Minister David Cameron, who spoke shortly after Ahmadinejad, harshly and directly criticised the human rights situation in Iran and its president. “He didn’t remind us that he runs a country where they may have elections of a sort but they also repress freedom of speech, do everything they can to avoid the accountability of a free media, violently prevent demonstrations and detain and torture those who argue for a better future,” Cameron said. On Wednesday, Iran finally released two U.S. citizens who had been jailed for nearly two years. They were arrested in July 2009 while hiking near the Iran-Iraq border and accused of spying for the U.S., although no evidence was made public to support that contention. However, just days before the pair were given bail, six Iranian documentary filmmakers were arrested by the intelligence service and later accused of cooperating with BBC Persian news channel and providing material for espionage activities. They were taken into custody shortly after the news agency broadcasted a documentary about the life and politics of Ali Khamenei, Iran’s Supreme Leader. “So we should never pretend that having elections is enough,” Cameron said, referring to Iran’s ongoing political and social crackdown. Two of Ahmadinejad’s opponents have been under house arrest for the past six months, and hundreds of activists remain in jail for participating in peaceful protests after his disputed re-election in 2009. “Ahmadinejad’s habitually vapid speeches at the U.N. this year was even more irrelevant and inconsequential in the context of the Palestinian bid for statehood,” Dr. Hamid Dabashi, a professor of Iranian studies and comparative literature at Columbia University, told IPS. “The drama of this year has been the obscene speech of (U.S.) President (Barack) Obama preempting the Palestinian historic right to statehood and its regional and global echoes in the context of the Arab Spring,” he said. On Sep. 20, dozens of pro-peace and anti-war U.S. advocacy groups and individuals met with Ahmadinejad, but the organisations were largely handpicked and did not press the president on human rights issues. During his time in New York, Ahmadinejad also met with a number of editors and journalists, but some Iranian-American journalists who cover Iran for major publications in the U.S. were not allowed to attend. “I believe the organisers wanted to invite those who might ask more general questions about Iran’s regional and international politics rather than those who might have asked Ahmadinejad questions about human rights and his domestic power struggles,” an Iranian-American journalist told IPS on the condition of anonymity.